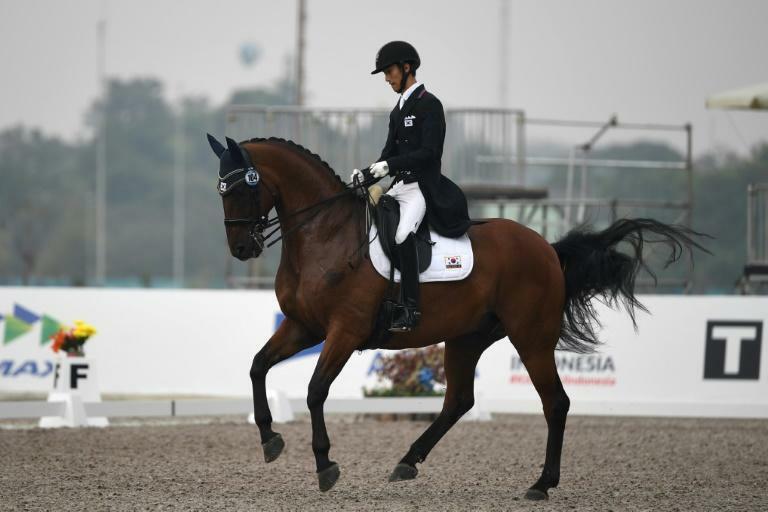 A South Korean athlete who was left out of the Asian Games squad four years ago to make way for the horse-riding daughter of the country's "Rasputin" bagged bronze in the individual dressage on Thursday. Kim Hyeok told AFP that his brush with Chung Yoo-ra, the child of a woman jailed alongside former president Park Geun-hye in a massive corruption scandal, had made him tougher at this year's Asiad in Jakarta. "It was difficult four years ago because I trained a lot," Kim, 23, said. "But I didn't think about those events today. I am better than four years ago and those events have made me stronger." Electronics giant Samsung paid for some 3.65 billion won ($3.25 million) worth of horses and equestrian training for Chung, now 21, in what prosecutors said was an attempt to bribe her powerful mother Choi Soon-sil, a close confidante of the then-president. The revelations were part of an influence-peddling scandal that rocked the country and toppled ex-president Park. In qualifiers for the 2014 Asian Games, Chung was selected for the regional Olympics held in her home country but Kim finished in fifth place -- and missed out. Chung made mistakes during qualification but South Korean media reported these were deliberately overlooked. Chung, known for her lavish lifestyle in Europe, went on to win a gold medal in the team dressage, but did not make the podium in the individual event. Kim, frustrated at missing out in such murky circumstances, considered quitting. "I stopped for a month but then I restarted and I have been training very hard since then," he said after clocking a score of 75.705. He secured third spot behind Malaysia's Mahamad Fathil Mohd Qabil Ambak, in silver position with 76.620, and Hong Kong's Jacqueline Wing Ying Siu, who topped the podium with 77.045. Kim also picked up a silver medal in the team dressage earlier this week. Choi -- nicknamed "Rasputin" for her influence over the then-president -- was found guilty of abuse of power, bribery and interfering in government business earlier this year. Chung, who herself became caught up in the scandal and was extradited from Denmark, has said she had no knowledge of the "special treatment" she allegedly received.